Thirty sets of hands work to create each and every one of our wedding albums. We invite you to check out some of the key features that make our luxury wedding albums the best in the world. We've also included examples of our cover materials, custom album cases and sample album designs. 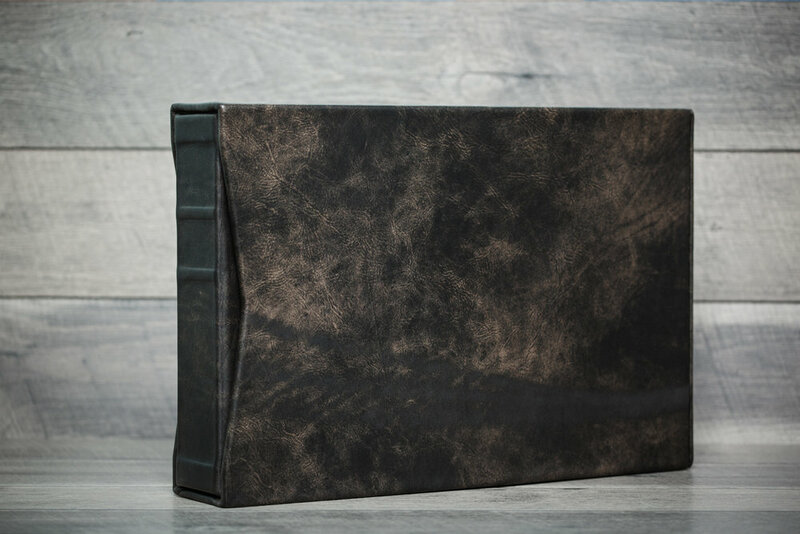 With endless possibilities for customizing your cover, your wedding album can be as unique as your story. Check out all of our leathers, silks, linens, fabrics, and vegan leather options. I (Melissa) cannot truly describe the feeling of sitting with my mother, after the wedding, flipping through my own wedding album. Both of us were already tearing up as we got to that one photo of her looking at me in my dress while I put my earrings on. I love how she is looking at me and looking at that image brings me right back into that genuine moment we shared together. The look on my father’s face when he saw me in my wedding dress for the first time is priceless and something I will remember forever. Lenny’s parents stood by the door teary eyed as Lenny and I saw each other for the first time, their expressions so powerful and full of love. When my sister cried happy tears - a series of four images tells the story of the love our family has for each other. On our wedding day everyone was there for us, in the moment with us, creating priceless memories with us and it’s these genuine powerful moments that mean the most. Still, to this day, years after Lenny and I’s wedding day, I’ll sit down with my album because it is like a time capsule back to that day. I can look back at the face he was making when he was standing across from me as we said our vows, and think of how he whispered the words I love you. Being able to hold our album in my hands, and physically turn the pages adds an element to our wedding photos that is beyond them just being saved on a thumb drive or posted online. It’s so deeply personal, it’s our story—and I can sit alone or with Lenny, or with anyone, and relive those moments and share the story of our day together over and over again. The incredible feeling of warmth, love and happiness is almost unexpected, and no matter how many times the book is opened and closed that feeling returns and lives forever. We offer these albums not because it’s another product to offer, but rather because of what our own album, our parents’ albums, and our grandparents’ albums mean to us. We believe in the power of printing your legacy.